We are pleased to announce that industry analyst firm Gartner Research has positioned VIDIZMO as a Challenger in its 2016 Gartner Magic Quadrant for Enterprise Video Content Management. 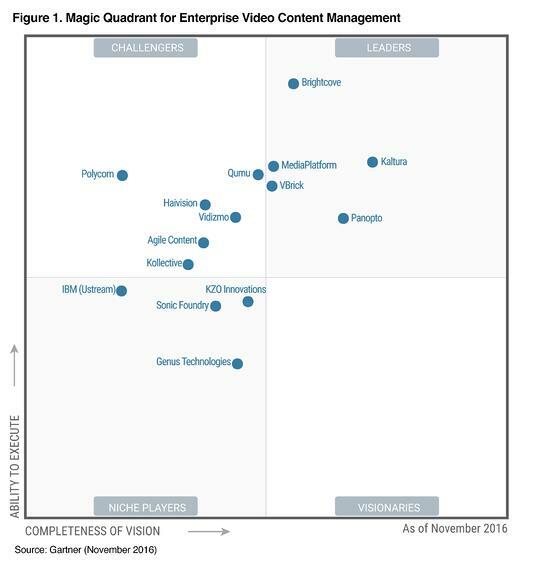 In only a year’s time, VIDIZMO’s ranking has grown significantly from Niche Player to Challenger in the Gartner Magic Quadrant for Enterprise Video Content Management. This progression is due to notable developments in technical sophistication and innovation that allows us to deliver secure, scalable, and differentiated solutions that cater to growing corporate needs for enterprise video content management, streaming video, and digital asset management. Gartner Magic Quadrant evaluates vendors within a particular market segment based on their completeness of vision and their ability to execute on that vision. So what does it mean to be a Challenger? According to the report, Gartner defines Challengers as companies with “a defensible business position,” having “demonstrated a commitment to the market.” Challengers are also considered to be developing a stronger vision for the future. Gartner attributes our strong positioning due to a range of factors, including but not limited to, VIDIZMO’s increased investment in innovative capabilities such as streaming video interactivity and search; ability to integrate seamlessly with business hybrid storage and application models; as well as specialization in streaming video hosting and delivery using Microsoft Azure. It must be noted that even though VIDIZMO’s enterprise video content management solution integrates natively with Microsoft Azure cloud, we also offer deployment options on-premises or in any public or private cloud. VIDIZMO’s Challenger status is also determined by its key differentiation based on the development of a new product called Digital Evidence Management, which specifically targets organizations involved in gathering digital evidence from security and surveillance videos in the legal domain. Gartner also identifies a strong support and services team as a key distinguisher, providing us a competitive edge over other players in the market, as referenced by our customers. What drives our streaming video ecosystem? As streaming video penetrates all workflows and experiences, we maintain a continued focus on driving innovation and momentum, to create possibilities, and empower enterprise users with the right tools to effectively manage their need for a consolidated enterprise video content management solution comprising a streaming video portal & digital media solutions. Flexibility: We offer best-in-class sync and deep product integrations with native applications and social platforms, providing you the flexibility to host your enterprise video content management application and content where you prefer; ingest streaming video and media content from myriad sources; and publish it where your audience exists. Our enterprise video content management system can also be easily customized to match specific business and IT requirements, branding, workflows, and procedures. Security and compliance: Data and platform security is of prime importance and high priority at VIDIZMO. With an exceedingly secure enterprise video content management solution, VIDIZMO is designed to maintain the most comprehensive security standards using content encryption, single sign-on integration, restricted portal access and permission controls, audit trails, restricted domain access, as well as video streaming over encrypted protocols. Moreover, installing VIDIZMO in Microsoft Azure or Azure Government Cloud provides the most robust cloud security and industry's best compliance standards. Innovation: We believe in bringing you best-of-breed streaming video ecosystem, incorporating the latest industry trends, feature innovations, and incremental improvements to platform functionality and design. Additionally, due to a strategic alliance with Microsoft, we have the ability to leverage and incorporate state-of-the-art innovations driven by the technology giant into our enterprise video content management solution. Agility: Our highly customizable enterprise video content management platform gives us the ability to promptly address and accommodate any unique business needs. Having specialized in the streaming video domain with a supremely configurable product, we believe we are ready to tackle any custom demands put forth by our clients. Customer Focus: With a customer-centric approach to business, we maintain a strong focus on delivering quality customer service with a blend of high responsiveness, consistency, proactiveness, and adaptability to customer demands. User experience: With a simple and user-centric design, we provide our customers the productivity and collaboration features they need to effectively utilize their digital media in a unified enterprise video content management platform. We take great pride in being recognized as a key player in a rapidly growing and highly competitive global market for enterprise video content management and streaming video platforms, and we look forward to a 2017 dedicated to even greater achievement as we continue to accelerate the pace of innovation at VIDIZMO. Click here to receive a complimentary copy of the 2016 Gartner Magic Quadrant for Enterprise Video Content Management or sign up for a free 30-day trial to experience and explore VIDIZMO’s streaming video platform.